China is one of the four oldest civilizations in the world, and jade is one of its most important symbols. According to archeologists, jade has been found and used for more than ten thousand years in China. The “Jade Culture” which originated from the New Stone Age and continues to this very day has distinguished China from other civilizations of the ancient world. Chinese regard jade as the pneuma of heaven and earth and use it as a medium between human beings and Gods, which gives an unusual religious significance to the jade. Jade became an indication of people’s prestige as well as an important part of maintaining the so-called etiquette of the social order. Meanwhile, the special use of the jade in funerals makes it mysteriously and religiously significant. At the same time, respect on jade’s natures which are compared as the virtue that noblemen should have is a great creation by the Chinese people. Thus, the spiritual Jade culture from ancient China is an interesting and unique case in world civilization. It is the material base of the soul of the Chinese cultural traditions. Lantian Jade is one of the most famous Chinese jades. It is unique and culturally significant because it was the first to be actively mined. The exploration and usage of the Lantian Jade goes back to the New Stone Age, which is more than 4000 years ago. The poet Li Shangyin (李商隐) of the late Tang Dynasty’s poem “Mermen weep their pearly tears down a moon-green sea, Blue fields are breathing their jade to the sun....(沧海月明珠有泪，蓝田日暖玉生烟) depicts the features of Lantian Jade vividly. Lantian Jade is divided into emerald (翠玉), dark jade (墨玉), colored jade (彩玉), white jade (白玉) and topaz (黄玉). It is a good material for carving, arts and crafts. According to the recent information, the reserves of Lantian Jade are more than 1 million cubic meters and are located primarily in Yuchuan Village (玉川乡)and Hong Mensi Village (红门寺乡). Lantian Jade is hardy, colorful, and fine-grained. Lantian Jade is also called “health Jade” because of its ability to relax tendons and beautify skin. Royalty and nobles treasured Lantian Jade for a variety of reasons. The Emperor Qingshihuang used it to make his imperial seal; Yangguifei used it as her jade belt. In fact, the Lantian Jade is not only famous for its long history, but also for its particular feature—jade surrounding stone (玉包石). Lantian jade is hard, its luster is mild and smooth, its texture is compact and it’s colorful. The ore is mainly composed of sedimentary rock and serpentine marble，tremolite, olivine and turquoise, brucite and other forms；chemical composition includes silicon dioxide, aluminum, magnesium, sodium monoxide, calcium oxide, copper oxide, ferric oxide and so on. Its Mohs scale of mineral hardness is between 4.5 to 5.5 degree. 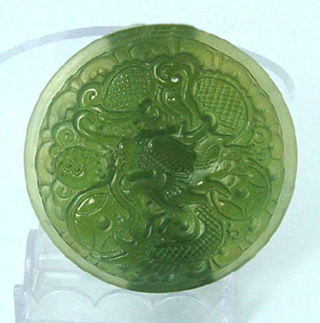 It’s an excellent material for jade carving and producing industrial arts products. Lantian Jade has become the cornerstone product of the Lantian Industry. It is exported to more than 20 countries and the first choice of foreign bureaus as souvenirs for visiting chiefs of state. How can you select the authentic Lantian Jade? Most Lantian Jade is emerald green, kind of like the color of young cabbage leaves. Other colors of Lantian Jade are suet white, azure, yellow and burnt henna. Experience and careful observation of the jade are quite important for you to select a nice jade. Jade is not only an object but also a symbol of culture. And now we are trying to inherit this excellent culture tradition, create contemporary culture forms and pass them to the future.